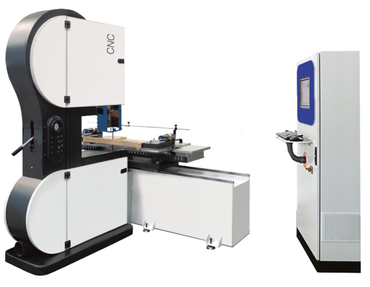 A true numerically controlled machining center for straight and shaped cuts. Wooden boards may be optimized with different cuts in sequence based on the type of wood, the size and the defects. The machine is equipped with a special system of motorized and independently controlled carriages. 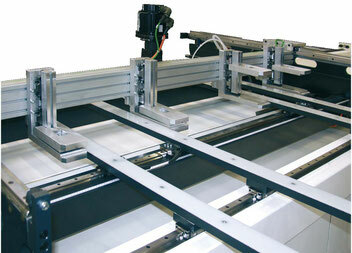 This system clamps the pieces using 2 sideways conveyors (patented), as shown in the picture. The system is recommended for cutting solid wood boards (timber boards). As the conveyor belts are independent, they also allow the operator to eliminate knots on solid wood panels (in manual mode). 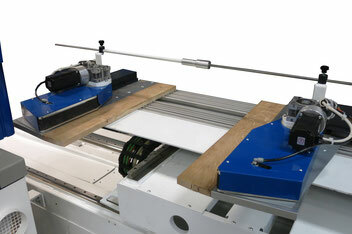 Dual.CNC may also be equipped with a working table fitted with 2 pneumatic clamps to handle wood panels. The working table may be moved in two directions, along both X and Y. This system is recommended to cut panels.